The invasion of the demons is grim news for the Griffin Empire. King Nicolai has been forced to postpone his wedding, rushing to the front lines to lead his knights into battle. Waiting expectantly in the safety of the Summer Palace at Whitecliff, Lady Isabel receives joyless tidings. The path to the front lies through the ruined lands of the Griffin Empire, where rumour and superstition run rampant. The Queen will have to strengthen her forces and persuade dissenters if she hopes to continue on her path. As feared, the scouts were but the vanguard of a larger Demon army headed by a Demon Lord. They are pillaging the Empire, leaving ruin in their wake. Now the time has come for Isabel to pass her first great trial - to fight and defeat an enemy hero and secure the area around the town of Ashwood. She will have to draw on all the skills she has learned in order to succeed. 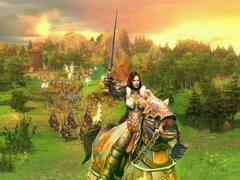 The Demon Lord Agrael prepares to rout Elven troops that are marching to assist the Empire. Isabel will have to outmanoeuver the enemy army and prevent the Demons from implementing their plan. The united forces of Isabel and Elven King Alaron should be able to put an end to the invasion and save Nicolai.